Fatima lives an unusual life as a concubine to the sultan. While her body and decisions are not her own, she does live a life of privilege in the palace and has plenty of time to spend with her best friend Hassan, the palace mapmaker. Hassan is gay and Fatima is the only Circassian who lives in the palace, so they don't fit in with the rest of the court. They spend their free time exploring the world through the magic doors Hassan can draw onto his maps. When the Spanish Inquisition arrives at the palace, things change very quickly. The sultan is willing to make sacrifices to keep the peace, starting with his mapmaker who is seen as a sorcerer by the Inquisitors. Fatima and Hassan escape the palace, searching for a place where they will be safe and accepted. 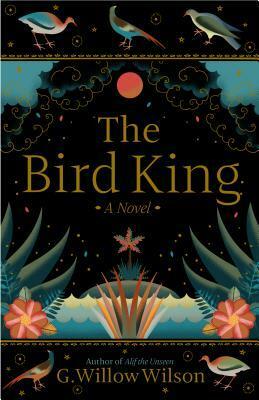 The Bird King is unlike anything I have read before. The magic in this story is apparent on every page, but its true focus is the friendship between Fatima and Hassan. While both of them will have romance in this story, their relationship is the heart of this story. It's wonderful to read about friends and see how the two of them support and fail each other in new and dangerous circumstances. There is a push and pull throughout between a blind faith and the work of putting one foot in front of the other, between kindness at your own expense and the expectation of pain and betrayal. Every few chapters, I could point out another place where the story could have diverted and revealed the history of a relationship or a certain kind of magic. But the 440 pages are devoted instead to Fatima and Hassan's search for a mythical island where they will finally be free from the Inquisition. Fatima is certain that with Hassan's gift for creating places and helping them to get there, they can reach the island they have read about and live under the protection of the Bird King. When I knew the end of the story was coming, I found that I was sad that my time with Fatima, Hassan, and all of the other characters was coming to an end. Surely this is the mark of a well-told tale, but G. Willow Wilson can also take this as my suggestion that she write another book set in this world!